Here are the 2012 entries from the home page accounts of our daily activities. Monday, December 31: watched fire works from roof of the Melbourne Town Hall. Friday, December 28: send out this bumper end of year email edition of The Mayne Report. Wednesday, December 26: tried out the bedlam of Westfield Doncaster on Boxing Day to sort Ipod touch issue. Tuesday, December 25: lovely Christmas with family at home. Monday, December 24: published ANZ, Graincorp and Incitec Pivot AGM reports on ASA website. Friday, December 21: completed ASA submission to CAMAC on future of the AGM. Thursday, December 20: two hour briefing on Melbourne's LEAN management program, plus final regular spot with Raph Epstein on 774. Wednesday, December 19: regular planning portfolio meeting at Melbourne. Tuesday, December 18: final full council meeting for the year in chamber all done in less than an hour. Monday, December 17: attended East Melbourne Group Christmas Function at Tiger den on Punt Road. Friday, December 14: capital works briefing then 2 hour bus tour around Melbourne and lunch with Southbank residents group. Thursday, December 13: Delighted MCC had this big win in VCAT stopping 32 pokies at Francis Hotel. Evening speech to Brighton Rotary Club. Wednesday, December 12: appeared in 7.30 story on Sydney casino battle and even chatted to Jeff Kennett at RACV President's dinner! Tuesday, December 11: stressed out chairing 12 finance items at full public committee meeting. Monday, December 10: in Sydney for ASA board meeting. Friday, December 7: wrote this lead story for Crikey on Lachlan Murdoch. Thursday, December 6: in Sydney for AGM of Ten Network Holdings. Wedensday, December 5: ASA monitoring and Victorian committee meetings, council planning briefing plus dropped in on MAV conference. Tuesday, December 4: breakfast speech to Melbourne Rotary Club then council commitments until 8pm. Monday, December 3: long session on Melbourne's 4 year plan, then speech to Toorak Rotary Club. Sunday, December 2: panel discussion at the big national Skeptics convention in Carlton. Saturday December 1: artistic walking tour around North Melbourne then panel debate with Adam Bandt at Fair@Square festival. Friday, November 30: speech at Our Community conference then took kids to lighting of City Square Christmas tree. Thursday, November 29: council briefings on planning and finance, attended Seek AGM then MC at CitySwitch awards. Wednesday, November 28: attended Docklands Community Forum, successful MAV motion quoted in Melbourne Leader. Tuesday, November 27: full day of council commitments followed by first public council meeting in chamber. See agenda and minutes. Monday, November 26: interviewed on ABC1's The Business about Gina Rinehart. Sunday, November 25: appeared on Inside Business, attended East Melbourne festival and worked on ASA magazine. Saturday, November 24: kids basketball duties and worked on ASA's end of AGM season wrap. Friday, November 23: pre-recorded Inside Business and worked on bumper summer edition of ASA's Equity magazine. Thursday, November 22: listened to Woolies AGM and EGM on webcast then attended Royal Melbourne hospital dinner. Wednesday, November 21: in Brisbane for QR National AGM, then evening speech to Templestowe Rotary Club plus MCA AGM. Tuesday, November 20: first contested votes and debate at public City of Melbourne meeting of councillors. Monday, November 19: 4 hour session on Melbourne's strategic plan, then attended Arrium AGM and RACV Tourism Awards dinner. Tuesday, November 13: full day of briefings, meetings and functions at City of Melbourne from 9am until 9pm. Monday, November 12: ABC radio spot on Network Ten chaos and attended Destination Docklands networking evening where LM spoke well. Sunday, November 11: played laser tag with 16 kids at Philip's 8th birthday party. We lost both games to smaller groups of older kids. Saturday, November 10: inspired by this Courier Mail story to book flights to Brisbane for QR National AGM on November 21. Friday, November 9: two hour governance briefing at council then spoke at 25th Tim McCoy annual dinner. Thursday, November 8: combination of time in city office and MCC, plus attended Manningham AGM in evening. Wednesday, November 7: spent 5 hours at City of Melbourne, plus evening session processing ASA reports. Tuesday, November 6: wrote and published ASA reports on REA Group, Fairfax Media and Whitehaven Coal. Monday, November 5: AGM season work in the morning, followed by council session in the afternoon. Sunday, November 4: busy day writing and publishing AGM reports for ASA. Saturday, November 3: opened about 250 pieces of stockpiled mail and did big clean out of newspapers. Friday, November 2: sworn in as City of Melbourne councillor. Thursday, November 1: in Sydney for Whitehaven Coal AGM and long ASA staff meeting. Wednesday, October 31: asked questions at Tassal and Centro AGMs. Tuesday, October 30: attended official declaration of the poll at Melbourne Town Hall. Monday, October 29: lovely lunch with FT columnist Ms MoneyPenny. Sunday, October 28: VEC computer declared was Melbourne councillor at about 6.30pm. Saturday, October 27: not official yet, but looking good in Melbourne City Council elections. See The Age online. Friday, October 26: interesting Echo AGM piece in The Australian, Crikey piece on Packer cronyism, meeting with Centro CEO and attended Carsales AGM where big protest on CEO pay. Thursday, October 25: in Queensland for Echo Entertainment and Suncorp AGMs. Wednesday, October 24: attended heavy 3 and a half hour Fairfax AGM where negotiated a pay cut for chairman Roger Corbett on the floor. Tuesday, October 23: big day of ASA AGM engagement and speech to Essendon Rotary Club. Monday, October 22: full day of ASA work. Saturday, October 20: interesting Michael West piece on Cochlear AGM in Fairfax papers. Friday, October 19: Philip's 8th birthday, busy day publishing AGM reports for ASA, sent out email edition of The Mayne Report and evening speech in Colac. Thursday, October 18: column for The Drum on News Corp AGM, processed lots of ASA reports, out to Philip's favourite pizza place for his 8th birthday. Wednesday, October 17: listened to News Corp webcast, interviewed on ABC News Breakfast, Crikey story on Cochlear AGM, interview on ABC Sydney about Channel Nine deal. Tuesday, October 16: in Sydney for Cochlear AGM and published this monster ASA report ahead of News Corp AGM. Interviewed by Ticky Fullerton on The Business. Monday, October 15: busy day editing and publishing ASA Voting Intentions, then attended evening candidates forum put on by Carlton Ratepayers' Association. Sunday, October 14: appeared on Inside Business, emailed this overdue edition of The Mayne Report, posted ASA's Cochlear voting intentions. Saturday, October 13: big day of kids basketball and late night of ASA research and Mayne Report work. Friday, October 12: pre-recorded Inside Business with Alan Kohler and phone hook up with ASA Company Monitoring Committee chairs. Thursday, October 11: letter in The AFR calling for QR National to do an SPP for retail investors. Wednesday, October 10: more media coverage for ASA on Billabong situation. Tuesday, October 9: another full day at ASA head office in Sydney. Home at 11pm. Monday, October 8: 12th wedding anniversary and spent full day at ASA head office in Sydney. Sunday, October 7: another full day on ASA matters. Saturday, October 6: ploughed through annual reports in preparation for AGM season. Friday, October 5: listened to ASX AGM on webcast out of Sydney. Thursday, October 4: interview on ABC Newsradio and 666 ABC Canberra about News Corp AGM and enjoyed excellent performance by ASA's John Curry at Transurban's AGM season opener. Wednesday, October 3: school holidays activities and more AGM season prep. Tuesday, October 2: long hours chasing down AGM details for ASA. Monday, October 1: quoted in The Age on Kennett and The Australian on Fairfax. Lodged preferences, photos and campaign statement for City of Melbourne before noon deadline. Now for the AGM season. Sunday, September 30: heavy day of preference negotiations on City of Melbourne. Saturday, September 29: skating 11th birthday party for Laura during grand final. Lots of fun. Friday, September 28: deadline for Manningham preference tickets, ASA policy committee, ploughed through huge box of mail. Thursday, September 27: radio interview with Sharon Firebrace, lodged group name for Melbourne, lunch with News Corp directors Sir Rod Eddington and Peter Barnes. Wednesday, September 26: fascinated by full list of Victorian council candidates, ASA IT session in afternoon. Tuesday, September 25: second day at ASA office in Sydney, interviews with ABC Tasmania and PM program on Gunns demise. Missed last Manningham council meeting but delighted with exec pay disclosure on p110 of the annual report. Monday, September 24: in Sydney learning the ropes at ASA head office in Chatswood, quoted in AAP feature on ASA's approach to forthcoming AGM season. Saturday, September 22: ploughed through a pile of AGM material. Friday, September 21: first of semi-regular spot on Sunrise reviewing story of the day. Formally nominated for City of Melbourne. Thursday, September 20: busy day preparing for AGM season. ASA evening meeting. Watched press conference with Gary Morgan and John Elliott after p1 story in The Age. Wednesday, September 19: resigned from ASA board and took up policy and engagement consultancy gig for AGM season. See announcement. Tuesday, September 18: regular spot on 774 ABC Melbourne, plus appeared on ABC TV's The Drum. Friday, September 14: participated in debate with emerging leaders facilitated by Leadership Victoria. Thursday, September 13: keynote speech to independent fuel and convenience store retailers. Tuesday, September 11: exited $10,000 Codan SPP, attended Manningham ASA meeting, regular ABC radio spot in Melbourne. Monday, September 10: attended briefing on Matthew Guy's proposed planning revolution. Sunday, September 9: attended opening of new $53m Greensborough pool. Friday, September 7: speech at Property Council conference in Melbourne, interviewed for doco pilot in Park Orchards. Wednesday, September 5: bumper Mayne Report email edition, interview on Faine and World Today about News Corp AGM. Tuesday, September 4: regular spot on 774 ABC Melbourne. Discussed Peter Cox tilt at Fairfax board and mining billionaires. Monday, September 3: local Fairfax paper reports on excessive interstate junketing by Cr Meg Downie. Attended opening of MC2. Saturday, September 1: panel discussion at Melbourne Writer's Festival. Thursday, August 30: panel discussion on Kay Review and short termism at Responsible Investment conference. Wednesday, August 29: assisted with article in Manningham Leader about excessive councillor expense claims. Tuesday, August 28: column for The Drum endorsing Elisabeth Murdoch, regular afternoon spot on ABC Melbourne, attended first hour of Manningham council meeting. Monday, August 27: attended packed submitters meeting at Manningham for $6m water treatment plant in Doncaster. Evening chat with Lindy Burns on ABC Melbourne. Friday, August 24: interviewed on The World Today about Elisabeth Murdoch's McTaggart lecture and on ABC radio's PM program about Steve Vizard. Thursday, August 23: another Crikey story on Gillard spiked, lengthy interview with John Stanley on 2UE about AWU-Slaters issue. Wednesday, August 22: letter published in Crikey on AWU-Gillard-Slaters-Wilson-Murphy saga, regular spot on 774 ABC Melbourne talking BHP, RBA and AWU. Tuesday, August 21: appeared on Sunrise, The Project, Sky Business and Lateline discussing falling executive pay. Monday, August 20: Crikey story on Gillard spiked, in Sydney for board meeting of Australian Shareholders' Association. Friday, August 17: curriculum day for the kids so took them to inspect libary at Manningham's new $40m MC2 precinct. Thursday, August 16: appeared on Sunrise to discuss record CBA profit and wrote this Crikey story on bank cartel. Wednesday, August 15: Crikey story on Olympics performance with full list of 45 companies worth more than $US100 billion. Tuesday, August 14: attended ASA Manningham branch meeting and regular spot on 774 ABC Melbourne. Monday, August 13: radio interview with Sharon Firebrace on 3KND. Friday, August 10: attended full day of ASA monitor training. Thursday, August 9: attended public lecture about Greg Barber court action against State of Victoria, plus ASA dinner. Wednesday, August 8: interview on ABC Tasmania about Gunns. Tuesday, August 7: missed first Manningham council briefing, regular spot on 774 ABC Melbourne, watched Southbank debate at City of Melbourne planning committee meeting. Monday, August 6: attended first hour of Transport Committee meeting, then council resignation took effect at 5pm. Friday, August 3: submitted this 3300 word resignation letter to Manningham mayor. Thursday, August 2: attending official opening of new $6 million Ted Ajani centre in Lower Templestowe. Tuesday, July 31: public council meeting from 7pm. Monday, July 30: attended submitters meeting at council on function centre proposal. Friday, July 27: Crikey story on Labor's preference acrobatics in Melbourne by-election. Thursday, July 26: only losing candidate to attend declaration of the Melbourne by-election poll with Jennifer Kanis at VEC. Wednesday, July 25: Crikey story on potential Greens-Liberal preference deal in Victoria. Tuesday, July 24: back on the regular 774 ABC Melbourne spot with Raph Epstein talking by-election, Murdoch, Billabong and media regulation. Monday, July 23: turned 43. Lovely Thai dinner with the family in Brunswick St. Kids loved sitting on the floor. Sunday, July 22: sent this Mayne Report special email edition on Melbourne by-election in a day of post-mortems and analysis. Saturday, July 21: big day on the booths in Melbourne by-election. Pleased to finish 4th with 4.75% of the vote. Friday, July 20: Jon Faine outside broadcast from Victoria Markets, pre-poll and more logistical preparation for Saturday by-election. Thursday, July 19: interviewed on ABC News24 Breakfast wearing the "stop the pokies" campaign t-shirt. Attended SP Ausnet AGM with power infrastructure queries, handed out at pre-poll, attended farewell for fab Manningham CEO and interviewed on ABC Newsradio. Wednesday, July 18: Crikey story on Murdoch cash received Paul Howes, ReachTel poll in The Australian has vote at 4.3%, quoted in AFR story about cash handouts driving pokies, RN Breakfast story about by-election, handing out at early voting centres. Tuesday, July 17: by-election Q&A with Melbourne Weekly, picked up how to vote cards, attended Doncaster Rail meeting, handed out at early voting, attended council briefing. Monday, July 16: sent this bumper Mayne Report email edition, attended Kensington candidates forum and appeared in this 7.30 story on Melbourne by-election. Saturday, July 14: participated in candidates debate in CBD facilitated by Australian Christian Lobby. Friday, July 13: registered how to vote card at VEC, Crikey item on ABC ban. Thursday, July 12: quoted in The Age slamming ALP's "Green stooges" dossier, Crikey story on Melbourne preference plays. Wednesday, July 11: speech on governance to ASA Investor Hour in Melbourne, interview with 7.30 for upcoming story on Melbourne by-election. Tuesday, July 10: Crikey story on reforming Australia's takeover laws, bumper Mayne Report email edition and participated in lively candidates forum at Docklands. Monday, July 9: sent this rallying call against tabloid excess to 1000+ councillors, Crikey story on Herald Sun pay disclosure, attended Manningham protest against water treatement plant, appeared on The Drum, Melbourne candidates' forum in the evening. Sunday, July 8: short story in The Sunday Age on VEC investigation into ALP dirt sheet. Saturday, July 7: quoted above the fold on p1 of The Age about Herald Sun changes. Friday, July 6: discussed Gina's sell-down on ABC TV Breakfast, plus ABC radio in Newcastle. Gave some grabs to Channel Ten news on Herald Sun changes. Thursday, July 5: Crikey story on Rupert, Packer, Woolies and the pokies. Interviewed on ABC Victoria about council super blowout. Chatted to Waleed Aly on RN Drive about Gina sell-down. Also did ABC WA regional into the Pilbara with "Bazza". Wednesday, July 4: interviewed by Jon Faine about dirty Labor tactics in Melbourne by-election, attended MAV briefing on $400 million superannuation hit for Victorian councils, appeared in 7.30 Report story about James Packer's Echo stalking. Tuesday, July 3: live interview on ABC TV midday report about David Jones bid and Gunns write-downs, did some David Jones grabs for ABC 7pm TV news, New Matilda piece on Melbourne by-election, watched City of Melbourne planning meeting, attended Oursay launch and Manningham briefing in evening. Monday, July 2: radio interview on ABC Melbourne about David Jones, ABC Tasmania TV and radio chats about Gunns write-downs. Sunday, July 1: spent day in the Melbourne electorate with family. Friday, June 29: Crikey story on Rupert's rising power with demerger. Thursday, June 28: Fran Kelly chat on Gina Rinehart at 6.35am, local paper reports councillor expenses win, Crikey story on Bolt, McCrann and Gina. Wednesday, June 27: breakfast chat on ABC News 24 and Radio Australia about media shake-ups. Crikey story on News Corp demerger. Evening speech to a group of spindoctors and chatted with Waleed Aly on RN Drive. Tuesday, June 26: described as ludicrous by Gerard Henderson, appeared on Sunrise, interviews on ABC Newcastle, ABC Brisbane and Triple J's Hack program. Attended council meeting where councillor expenses disclosure finally got up. Crikey story on GetUp! EGM tactic against Woolies. Monday, June 25: three different chats with Red Symons from Italian cafe at Templestowe Village during Italy vs England game. Crikey story on the crisis in local journalism. Interviewed on ABC Sydney and Newsradio about Fairfax's editor purges. Council briefing and submitters meeting in evening. Sunday, June 24: featured in this Sunday Age piece about Manningham and councils by John Elder. Friday, June 22: formally nominated for Melbourne by-election, attended ballot draw. Thursday, June 21: interviewed on Sunrise about News Ltd, Crikey piece on Alan Kohler, interview on ABC Newcastle about newspapers. Wednesday, June 20: motion on councillor expense claim disclosure released in agenda for June council meeting. In Sydney for speech. Interviewed on Ten's late news. Tuesday, June 19: interviewed on Sunrise about Fairfax, slammed Gina on RRR and did likewise on ABC NSW in afternoon. Monday, June 18: submitted AICD assignment and sat 150 minute exam in city, then chaired lively and worthwhile meeting of Manningham's Open Space Committee. Sunday, June 17: Fairfax local paper reports Gillard $1 bet preferences offer in Melbourne by-election. Friday, June 15: preferences meeting with Adam Bandt and Greg Barber, wide-ranging interview on Radio National's The Media Report and chatted about Gina's Fairfax play on ABC Perth. Thursday, June 14: meeting with memoir publisher, coached daughters to 1 point basketball win and attended council budget briefing in evening. Wednesday, June 13: dinner speech in Ballarat celebrating ASA branch's 10th anniversary. Tuesday, June 12: Crikey story on Kerry Stokes, lunch with media academic and council briefing in evening. Quoted in Moonee Valley Weekly on pokies. Monday, June 11: pre-recorded interview with 7.30 on James Packer. Friday, June 8: interviewed on 702 ABC Sydney and Lateline after John Story resigned as Echo chair. Thursday, June 7: surprised to read on Fairfax website that Cr Reid and Cr Macmillan are now denying threatening to resign. Wednesday, June 6: Crikey story on James Packer's misleading campaign about John Story. Tuesday, June 5: attended Melbourne Press Club AGM, ASA Victorian committee meeting, MCA audit committee and spoke at Ivanhoe Grammar careers night. Monday, June 4: announced candidacy in Melbourne by-election, Crikey story on Mark Arbib's Packer job. Regular spot on 774 ABC Melbourne, appeared on The Drum, chat on ABC Adelaide about markets. Friday, June 1: interviewed for commercial TV pilot program and speech at accounting industry conference. At Etihad for great Tigers victory. Thursday, May 31: Crikey story on Packer-Kennett media connections, interviewed by Richard Glover on ABC Sydney. Wednesday, May 30: Crikey story on James Packer's Jeff Kennett play against Echo Entertainment Group. Interviewed on ABC Melbourne plus for The Business. Lobbed a nomination for the Melbourne Press Club committee. Tuesday, May 29: spoke at Communities in Control conference, regular spot on 774 ABC Melbourne, attended marathon 5 hour council meeting. Monday, May 28: gave some quotes to The Australian for this story on BRW Rich List. Sunday, May 27: watched the Bulleen Boomers Big V men beat the Melbourne Tigers at TLC. Saturday, May 26: at the MCG to see Tigers flog the Hawks. Friday, May 25: interviewed on 774 ABC Melbourne about Gina Rinehart foreign labour deal. Thursday, May 24: Crikey story on coming Fairfax write-downs. Wednesday, May 23: busy day on council matters ahead of some big votes and debates. Tuesday, May 22: interview with RRR on Thomson and Facebook. Regular spot on 774 ABC Melbourne, plus Crikey story on pokies reform. Monday, May 21: Crikey story on Facebook float. Sunday, May 20: appeared on Inside Business discussing ASX capital raising rules amongst other topics. Saturday, May 19: stayed up late watching Facebook debut on CNBC. Friday, May 18: pre-recorded Inside Business with Alan Kohler, plus interviewed on ABC Melbourne about Facebook float. Thursday, May 17: represented Manningham at Municipal Association of Victoria state council. Wednesday, May 16: interviewed on The World Today about Murdoch scandals, interviewed for TripleJ's Hack program on this banned Getup pokies ad. Tuesday, May 15: attended Coca Cola Amatil AGM in Sydney, regular spot on 774 ABC Melbourne, plus discussed Federal budget with George Megalogenis at the Wheeler Centre. Listen here. Monday, May 14: appeared on Q&A and wrote Crikey story on various Liberal gambling dealings. Friday, May 11: lengthy interview with Jane Hutcheon on ABC TV's One Plus One. Thursday, May 10: see local paper coverage of Manningham's 10 year financial plan. Wednesday, May 9: Crikey story on Wayne Swan's various budget fiddles, interviewed by Ten and Seven news on Gina Rinehart, ABC Tassie spot on budget, regular spot on 774 ABC Melbourne and interviewed about executive pay rorts on RN Drive. Tuesday, May 8: Manningham Leader reports on council colleagues wimping executive pay disclosure. Special council meeting on budget in evening. Monday, May 7: Crikey story on latest round of pay-TV piracy wars between The AFR and The Australian. Friday, May 4: Manningham's draft budget now public. Proposed rate rise of 6%. Crikey story on Packer casino play. Thursday, May 3: Crikey story on Rupert Murdoch and James Packer. Wednesday, May 2: Murdoch chats on ABC Sydney, ABC Victoria, Network Ten and 2UE. Attended ASA AGM and also interviewed for Hack story on MRRT. Tuesday, May 1: attended ASA board meeting, regular spot on 774 ABC Melbourne and council briefing in evening. Monday, April 30: attended ASA board meeting and Melbourne Weekly Eastern reports on delayed pay disclosure vote at council. Sunday, April 29: attended centenary of Templestowe Park Tennis Club. Saturday, April 28: sledged in The Weekend Australian for tweets about Rupert and attended MAV conference. Friday, April 27: attended welcome dinner at MAV Councillor Development Weekend. Thursday, April 26: big day of Rupert interviews. Appeared on ABC News24 at 7am, Radio Australia at 7.30am, ABC Perth, ABC Melbourne and wrote this Crikey story. Wednesday, April 25: nice ANZAC Day with the kids and watched 4 hours of Rupert's Leveson appearance. Tuesday, April 24: Crikey story on Slipper and pokies, interviewed on RRR about Murdoch, ethics speech at major hospital and public council meeting in evening. Monday, April 23: council submitters meeting ahead of tomorrow's council meeting, interviewed on ABC Tasmania about Wilkie. Sunday, April 22: spoke at Rotary district conference at Docklands, appeared on Inside Business and attended Templestowe Festival. Saturday, April 21: interviewed on ABC Newsradio about latest Peter Slipper scandal. Friday, April 20: attended ALGWA conference at Manningham and pre-recorded Inside Business. Thursday, April 19: highly regarded Manningham CEO Lydia Wilson announced resignation after more than 5 a half years of great service. Wednesday, April 18: attended VLGA working group on gaming and part of nursing home board meeting. Tuesday, April 17: speaking gig with Jon Faine in Toorak, exited Blue Energy SPP with $500 gain and council briefing in evening. Monday, April 16: lodged two notices of motion for next week's council meeting plus wrote this story on executive pay disclosure for Crikey. Sunday, April 15: spent several hours working on the memoir, plus enjoyed watching The Logies. Friday, April 13: attended Manningham breakfast for local state MPs, wrote this Crikey story on Robert Doyle's dealings with the Murdoch family and guest Tweeted on Lateline. Thursday, April 12: attended Macquarie Atlas AGM in Sydney, interviewed by Jane Hutcheon for One Plus One, regular 774 ABC Melbourne spot and evening debate against IPA's Chris Berg on Finkelstein recommendations. Wednesday, April 11: Paula started new job so busy day with the kids given school holidays. Tuesday, April 10: drove back from Cobram, made $310 on Austin Ex SPP and council briefing in evening. Monday, April 9: back up to RACV Cobram for one last day with family on Easter holiday. Saturday, April 7: back home to work on memoir after two days at RACV Cobram with the family. Thursday, April 5: interviewed for this NPR feature on Rupert Murdoch's Australian history. Wednesday, April 4: sent this Mayne Report email edition, regular spot on 774 ABC Melbourne and interviewed on The Drum about James Murdoch resigning as BSkyB chair. Tuesday, April 3: attended Ownership Matters governance conference, debated with Ziggy Switkowki on remuneration consultants and attended council budget submissions. 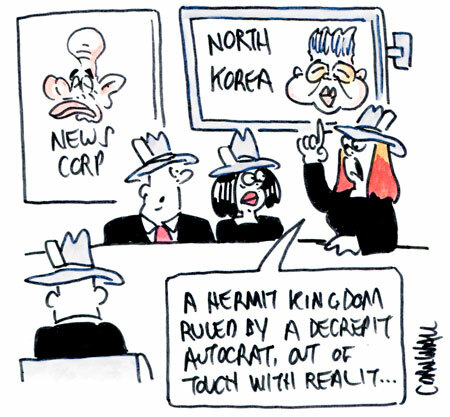 Monday, April 2: Crikey story on News Ltd relations with Fairfax after pay-TV piracy revelations. Attended council transport committee meeting. Friday, March 30: AICD course then did spin segment on 774 ABC Melbourne with Peter Reith. Thursday, March 29: MC of Economic Development Australia conference at Manningham, then attended MAV Metro Forum and guest tweeted for Lateline. Wednesday, March 28: interviewed by Jon Faine, Waleed Aly and ABC NewsRadio about Murdoch pay-TV piracy, plus wrote this Crikey story. Tuesday, March 27: Crikey story previewing Manningham pokies vote and attended public council meeting. Monday, March 26: 12.15am interview with Tim Shaw about Queensland election on Fairfax Radio nationally. Saturday, March 24: home from Quills at 3am, then up for two kids basketball grandfinals before a night of Queensland election watching. Friday, March 23: attended AICD course all day, then Melbourne Press Club Quill awards at Crown. Thursday, March 22: Crikey story on Paperlinx EGM, regular spot on ABC Melbourne, chat on ABC Gold Coast about NRL and attending Doncaster Rail briefing. Wednesday, March 21: conference call with Ziggy Switkowski ahead of remuneration debate next month, plus attended board meeting of Manningham age care provider. Tuesday, March 20: ASA board hook-up in morning, interview about continuous disclosure on RN Drive with Waleed Aly. Council briefing in evening. Monday, March 19: presented at Gold Coast insolvency conference. Sunday, March 18: attended part of Pitcher Partners insolvency conference on Gold Coast. Friday, March 16: story in The Age about running for Melbourne City Council, chaired quarterly Doncaster Hill developers breakfast at Manningham and attended AICD course. Thursday, March 15: Paula back from 10 day trip to China. Wednesday, March 14: Crikey story on Future Fund buying out Gina. Regular spot on 774 ABC Melbourne, debate on Gina Rinehart at Readings and speech to Bendigo Community Branch. Tuesday, March 13: Crikey story on Packer family political contradictions and attended ASA Manningham meeting. Monday, March 12: Crikey story on Gina Rinehart and Fairfax. Melbourne Weekly story on Doncaster Rail. Friday, March 9: attended AICD directors course all day. Interview on ABC Tasmania about Gunns. Thursday, March 8: Cut & Pasted by The Australian, sharemarket speech to U3A. Wednesday, March 7: Crikey story on Finkelstein Report, Manningham Leader story on upcoming pokies rates vote, plus attended ASA State committee. Tuesday, March 6: early morning interview with Tim Shaw on Fairfax Radio overnights. 5 hour council briefing in evening. Monday, March 5: Melbourne Leader ran this story on coming tilt at Melbourne City Council. Sunday, March 4: labelled a "lefty" by one of News Ltd's more left wing columnists. Saturday, March 3: opened the Melbourne Didgeridoo and Cultural Festival on behalf of Manningham's mayor. Friday, March 2: story in The Age about proposal for a different pokies rates regime in Manningham to fund expanded problem gambling programs. Thursday, March 1: Crikey story on James Murdoch, plus spoke to JJJ's Hack program, ABC News 24 and regular spot on 774 ABC Melbourne discussing various billionaires. Wednesday, February 29: Crikey story on James Packer's Sydney casino push. Tuesday, February 28: interview about Gunns on ABC Tassie, Crikey story on why Wayne Swan should quit, evening council meeting and interviewed by Inside Business on Packer's casino push. Monday, February 27: interview on ABC regional Victoria on AGL's Loy Yang deal and attended two planning public meetings at council. Sunday, February 26: appeared on Inside Business panel discussion with Kohler, Bartho and Rouxie. Friday, February 24: SMH yarn on Lachlan Murdoch, council audit committee, pre-recorded Inside Business panel, speech on grant giving, dropped into ASA meeting on company monitoring and attended dad's 85th birthday dinner. Thursday, February 23: ASA board meeting, speech at Red Hill to Five Mile Press sales conference and interviewed on ABC Tasmania about Labor leadership. Wednesday, February 22: ongoing stoush with Burnie mayor Steve Kons in Burnie Advocate. Tuesday, February 21: speech to Monash branch of ASA then evening council briefing. Monday, February 20: emailed 15,000 with latest edition of The Mayne Report. Chats on ABC Tasmania, ABC WA and 2UE about Rudd-Gillard saga. Friday, February 17: panel discussion at property industry lunch. Thursday, February 16: regular spot on 774 ABC Melbourne talking business then attended public meeting about Kew Cottages. Wednesday, February 15: speech to Bendigo branch of the ASA. Tuesday, February 14: column for The Drum on "Rupert Murdoch and The Sun". Attended council briefing in the evening. Monday, February 13: Crikey story on Lachlan Murdoch's regulatory challenges with ACMA. Interviewed about Murdoch on ABC radio's PM program. Saturday, February 11: interviewed by Geraldine Doogue on Radio National about Macquarie Group's outlook then attended all-day council strategic planning session. Friday, February 10: all day photo shoot at home for cover of memoir, then attended council strategic planning session. Thursday, February 9: studio interview about Rupert on ABC News 24 breakfast, Crikey story on News Corp results and regular 774 ABC Melbourne spot in arvo. Wednesday, February 8: interviewed on ABC Tassie and The World Today about Gunns rescue. Crikey story on apparent Lachlan Murdoch cross-media breach, asked pokies questions at St Kilda Football Club AGM in evening. Tuesday, February 7: council briefing in the evening. Monday, February 6: Crikey story on News Corp and Sir Rod Eddington's Australia Day gong. Sunday, February 5: column for The Sunday Age on Gina Rinehart. Friday, February 3: Crikey story on political donations and Kevin Andrews. Appeared in this Today Tonight story on Gina Rinehart. Thursday, February 2: attended 5 hour session reviewing CPA ethics and governance program, then regular spot on 774 ABC Melbourne. Wednesday, February 1: interviewed on ABC News Radio about Gina Rinehart's Fairfax raid. Also did Lateline, Triple J's Hack program, ABC Newcastle, ABC Perth and ABC Gold Coast. Tuesday, January 31: national interview about press secretaries with Tim Shaw on Fairfax radio network at 12.10am, attended scheduled mediation in the CBD and then first public council meeting of 2012. Monday, January 30: attended meetings at council. Sunday, January 29: loved the penguins at Phillip Island then back to Melbourne and watched end of epic tennis final. Saturday, January 28: interviewed about foreign ownership doing the supermarket shopping on new Radio National show about food. Thursday, January 26: breakfast address at Moreland Rotary Club Australia Day function then back to Phillip Island. Tuesday, January 24: meeting with Doncaster Rail working group then first council briefing of the year. Monday, January 23: interviewed on ABC News 24 on pokies, Crikey story on pokies, then attended tennis and did 30 minute Drive spot on 774 ABC Melbourne. Sunday, January 22: Melton Leader story on our top 15 councillors now online. Saturday, January 21: followed Wilkie announcement on Gillard's betrayal from Phillip Island. Friday, January 20: interviewed about pokies on 5AA and wrote a Crikey story on Stop The Loss launch. Thursday, January 19: Crikey story on pokies debate and spent afternoon with visiting US journalist talking Murdoch. Wednesday, January 18: back from Phillip Island after a couple of days with the kids as Paula worked. Monday, January 16: Fairfax local paper published this story on CCSSCI defamation settlement. Sunday, January 15: back home after lovely few days at Thredbo. Thursday, January 12: interviewed by John Stanley on 2UE about super fund governance. Wednesday, January 11: Manningham Leader published this story on state government interest in council matters. Monday, January 9: expanded this list naming 15 best local government councillors in Victoria. Friday, January 6: interviewed on 774 ABC Melbourne about coming demise of Eastman Kodak and updated Mayne Report Rich List. Wednesday, January 4: Manningham Leader published this story on CCSSCI defamation settlement. Tuesday, January 3, 2011: thoroughly enjoyed The Iron Lady. Friday, December 30: sent out this bumper end of year email edition of The Mayne Report. Thursday, December 29: worked hard in Olympic Room at MCG as Cricket Victoria thanked local government. Friday, December 23: exited $45,000 Origin Energy notes play with gain of $850 and appeared on last Lindy Burns 774 ABC Melbourne Drive show. Thursday, December 22: end of year piece for Crikey dishing out some business awards and attended 7 hour defamation mediation conference which eventually settled. Tuesday, December 20: had 55-minute discussion with Rod Quinn on the year in review from 10-11pm on ABC local radio.